Strict vegetarians, ace lawnmowers, excellent watchdogs, intelligent, individualistic, opinionated, sociable, and good conversationalists. Geese are great if you have the room: a fair-sized lawn or a small meadow, and a pond helps, but it's not essential. They're very little trouble, they can get most or all of their food from grazing and they help control weeds. The American goose is one of the few domesticated goose breeds which originated in the United States. Some believe the breed was developed from buff mutations in flocks of wild Graylag geese and others think they may have been created from buff colored geese, like the Buff Back, Pomeranian and Pilgrim which came from Europe. 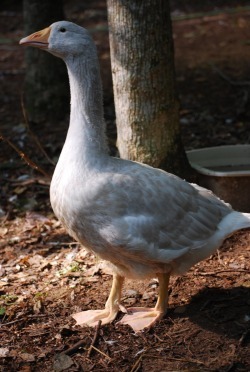 This breed is a medium to heavy, smooth breasted, and double lobed, with a stance similar to the Embden Goose. 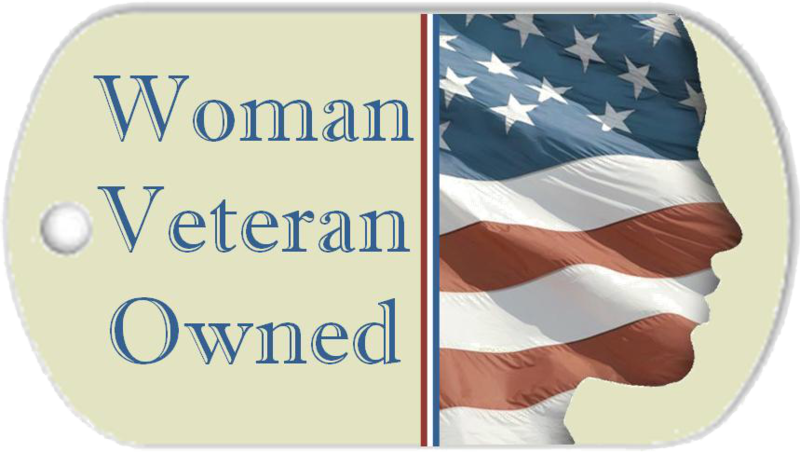 The American is a calm, sociable and friendly goose, very loyal and affectionate, particularly to its owners. It's graceful, elegant and a bit on the curious side, nearly always with his beak up in the air, looking all around to see if there might be something new to check out. This is a truely lovely goose to watch gliding along through the barnyard with flock in tow on the way to grazing. And it's a real treat to see them acting a bit silly while splashing in the pond, bup-bup-bupping their conversations, and racing from one pool to another to jump in and out playfully. The American Buff is a medium-large weight goose with ganders weighing about 20 pounds and geese weighing about 18 pounds at maturity. Buffs are a medium shade of buff with no grey. The best colored offspring are a lovely apricot-fawn color. 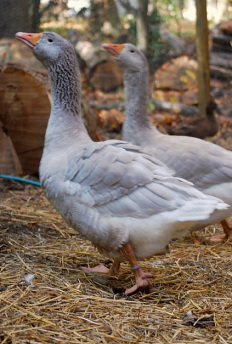 American Blue and Lavender Ice are two handsome varieties of the the American goose which are the fruit of Dave Holderread's 20-year investigation of the genetic intricacies of blue color in domestic geese. The plumage of the Blue is a pretty bluish-gray; the Lavender Ice is an exquisite silver-lavender. Bills are orange and the eyes are brown. These geese have the same solid conformation as the American Buff, and typically weigh between 14-22 pounds. Most females lay 30-45 eggs in the spring breeding season if eggs are gathered daily. When allowed to set, they make excellent natural parents. The goslings are hardy, fast-growing and superb foragers. With their unique colors and many practical attributes, they make a superior goose for the homestead or yard. Americans are good-natured and, on the whole, non-aggressive but they still retain the spirit of most goose breeds: they make noise when they sense danger. It’s this watchdog characteristic that geese are best known for. One of the most famous stories about Ancient Rome is the legend of the Capitoline Geese. When Rome was routed in 390 BC by the Gauls, the Romans took refuge on Capitoline Hill. For 7 months the Gauls held the city at siege but one night while the Romans slept the Gauls attempted to sneak up the hill. Before they reached the summit the Capitoline Geese honked and squawked until the Romans woke and forced the Gauls to the bottom and saved the city. Not just good watchdogs, they also will help you maintain a perfect sustainable garden - using geese to control weeds is an excellent practice. They don’t compact the soil the way machines or people do. They will happily and industriously work seven days a week, rain or shine. Their agile necks allow them to pull weeds close to and from within the crop plants, where machine or hoe can’t. All of this is accomplished while the geese are naturally spreading nitrogen-rich manure all over the field. It’s important to start them on weeds as goslings rather than lush grass and provide them with plenty appropriate forage so they don’t resort to eating your crop. Just be sure to lock them out of the strawberry fields before they can steal all your ripe berries! Geese don’t lay as many eggs as ducks each season, however, one goose egg is a meal for two. Geese are primarily spring layers. If adequately fed in mild climates, geese often begin laying the first part of February or early March. Geese typically lay every other day although some females will ovulate two or more days in succession. Unlike their next of kin, the domestic ducks who nearly always deposit their eggs in the early morning, geese lay throughout the day. Peak production is reached during moderately cool weather, and normally slacks off soon after the mercury consistently climbs to 80 degrees or higher during the daytime. They love to have a laying nest provided in a shelter or in a barn so they can lay their eggs in a quiet and secure environment. The American geese are also very good parents and take good care of their goslings. Even a single gander will adopt goslings. Females will often go broody and are good setters, hatching out their fuzzy little goslings in 27 to 32 days. If fed a balanced ration with vitamins and minerals that has 18 to 20 percent protein a month prior to and throughout the laying season, American geese can produce goslings in their first year. When a year-old goose is allowed to incubate her own eggs, Dave Holderread suggests that the first clutch be removed, encouraging the goose to lay a second nest-full which should hatch better. Ganders can be aggressive during the breeding season, because their big job is protecting the sitting goose or young goslings. True partners, you'll find that a gander will share in the brooding and rearing duties to give the mother goose a break to leave the nest from time to time. 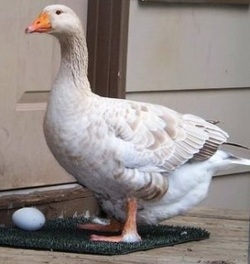 The gander may sit on the eggs to keep them warm while the goose gets a bite to eat and attends to the call of nature. And if a gosling hatches ahead of the rest, once it's dry the mother will often pass it off to the gander to care for while she hatches the rest of the brood. The American Livestock Breeds Conservancy lists the American Buff goose as critically endagered in the U.S.; meaning there are fewer than 500 breeding birds and five or fewer primary breeding flocks. More information about ALBC and the waterfowl census can be found on: www.albc-usa.org. Because of their fast growth rate, medium size and white feathers, Americans are a wonderful choice for meat production. Goose is traditionally a more popular holiday bird in Europe than in the U. S., probably because in America, turkey (wild and plentiful at our founding) was a natural choice for the Christmas feast. However, goose meat is darker (including the breast), fuller bodied, and more intensely flavored than our common commercial turkey. Of all fowl, goose meat offers the most opportunities to match with wine. 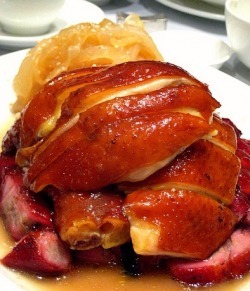 Unlike turkey, roast goose can be served without a sauce, as the meat is moist, but would benefit from the use of chutney made using nuts and fall fruits (grape juice, apples, pears, figs, walnuts and hazelnuts). 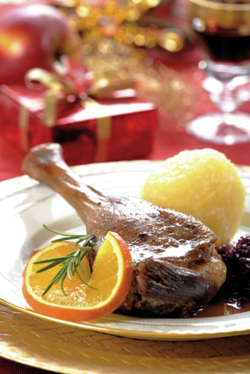 For centuries goose fat has been hailed as tasty and texturally rich, the French are famous for their cassoulet using goose fat, beans and vegetable, but most famous of all now is confit of goose or duck. If properly prepared, a confit of goose or duck is crisp, deliciously rich, and delightfully satisfying. A case for the return of the Christmas Goose: Turkey has been crossbred for the commercial market, so its meat has become more or less mushy (not the case with heritage turkey breeds). Geese have been spared this fate, and the natural cycle of raising geese is still intact: hatching, between April and July, and harvesting in September.